There are a couple options you can use to spy on your bunnies. These are the methods that I have used before (and am using) or have also momentarily entertained. #1 Setup a webcam with a computer. This was the first method I used to monitor Bao Bao and Luna back in my college days. I had happened to have a dinner table appropriately positioned from their x-pen such that I could have a laptop and attach a webcam to it and be able to see their entire pen. Spying on Bao Bao and Luna on Ustream with a laptop/webcam combination. For those interested, the webcam model I bought for this purpose was the Logitech HD Webcam C270 for ~$25. With 720p viewing and under $30, it was a cheap solution for a streaming webcam. Next, as for how to view this stream remotely, you also have a couple of choices. Use a streaming service such as Ustream, Livestream, etc. I chose Ustream since that was the first popular choice I came across, and it also had password-protection for channels. This was useful as I didn’t want just anyone to be able to view my bunnies and the inside of my apartment. What was also great about Ustream was that it made it easy to share on Facebook to share with my other friends. 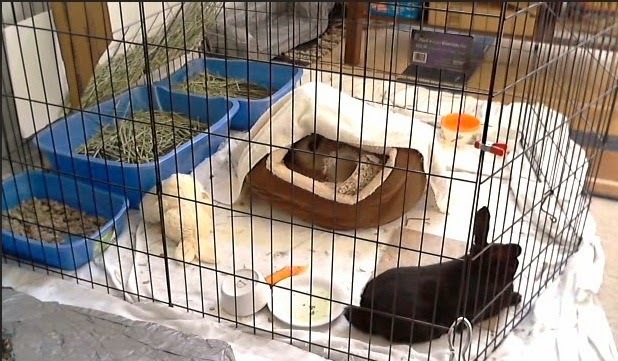 Additionally, the webcam would be accessible 24/7 without much effort as long as the browser and laptop of the bunny webcam were on and running. Use Skype. 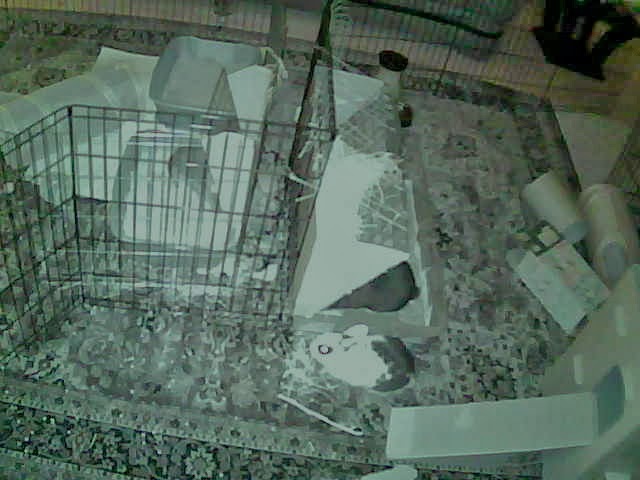 Make a separate account for your bunny webcam computer and have the program set to automatically receive video and share screens when you call it with your phone or computer. The exact setting is in Tools > Options > Video settings > Automatically receive video and share screen with.. [people in my Contact list only]. The benefit over using Skype vs a live streaming site is that you can disconnect and connect your webcam as needed. This method of spying of your rabbit has its benefits as it is easy to implement for most people as a laptop and webcam are tools that are either easily accessible or easily obtained. It also does not require too much tech-savviness. However, there were a couple of points that annoyed me about this setup. The only spare laptop we had to dedicate to this job was very old. Consequently, we had the problem where it would crash relatively frequently either due to overheating or other “old computer” reasons. When it crashed, the stream was unavailable, and there was no remote way to set it back up again. Same thing happened when the wifi cut out for mysterious reasons. Unless you set up a remote desktop program as well, which takes more knowledge and patience than most people have (including me), it makes it hard to reconnect the stream. Most webcams are unable to stream in the dark, so whenever the sun went down, it was basically useless. You need a spare laptop or computer to dedicate to this task unless you want to keep setting it up everyday. The other con to this method for bunny spying compared to the other options available is that computers are much more power-hungry, especially desktops. Unless your rabbit is confined in a small area, it makes it hard to have enough scope to view where the rabbit is at unless you set up multiple streams and cameras. For free-range bunnies, you basically need to be lucky in order to spy on them. You need to have extension and power cords appropriately positioned in order for your computer to have power, which can be dangerous and inconvenient to keep track of with roaming bunnies. Ustream did not have a convenient working app at the time that allowed me to easily stream from my phone. I could view the stream on my laptop with wifi, but if I were travelling, I was unable to spy on the bunnies. I suspect that this issue might have been solved by now though. #2 Use your smartphone as a webcam. This was one method I entertained briefly. There are several webcams out on the various OS stores that allow the ability to turn your smartphone (which should usually have at least one camera) into a webcam. Off the top of my head — for Android, since that is the phone ecosystem I use — there is IP Webcam and DroidCam Wireless Webcam among many others. I am positive you can probably find similar free apps for iOS and Windows phones as well. For the other more esoteric OSes like Blackberry and Palm I am not sure about. The benefit to this option is that it’s easy to implement if you happen to have an old smartphone laying around. It also takes less power than a webcam/computer combination. But like always, there are cons that turned me off this option. In order to position the webcam appropriately, you will need to invest in some sort of phone holder, such as a tripod. Basically most of the cons from option #1. #3 Use an IP camera. An IP camera, also known as an internet protocol camera, is a digital video camera that can send and receive data via an Internet connection. No extra computer needed. As IP cameras are small, about the size of a can of soda, they are much easier to position out of reach of nibbly rabbits. Has infrared so you can watch the bunnies even when it’s dark! I can remotely pan, tilt, and reboot the camera. 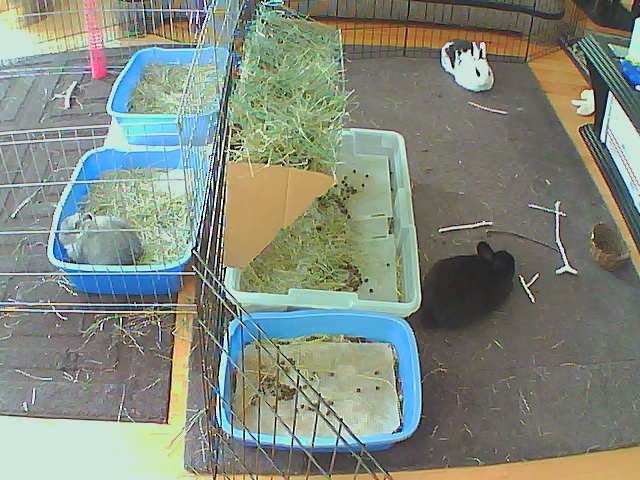 This allows me to be able to use a single camera to view my whole family room where the bunnies are currently situated. Additionally, if the camera is unresponsive for whatever reason, I can go on the remote interface to reboot the camera. As long as it is always plugged in and connected to the internet, I can control it. Can use wireless internet to reduce the number of cords needed. Extremely low-wattage at around 5W an hour vs over 40W for a laptop. The wireless antenna that comes with the camera appears to be very weak. If you have many networks in your area, the interference can make it impossible to use wirelessly. I ended up plugging the camera with an ethernet cable. This particular model (and some other Foscam models) has the potential to have issues with highly detailed scenes. For instance, too many x-pen bars can cause my camera to crash and reboot constantly. I solved this issue by lowering the resolution to 240p. Assuming that you can’t hide or move the details, another way to solve it is to lower the brightness and contrast, but it makes the viewing quite ugly, so I preferred to make the stream a lower resolution. From the forums, it appears to be a hardware issue and exchanging it for another unit appears to be successful for most users. So if you buy your unit from Amazon or another authorized Foscam dealer, you do not need to worry about this particular problem. However, I unfortunately bought it from a vendor that did not accept returns and was not authorized either in order to obtain the manufacturer’s warranty, so I made do with my workarounds. >< There were also some dedicated engineers that were willing to take apart their camera to wire their own fix here. While the pan and tilt abilities were great, it was hard to find a position in the room that allowed me to see every possible angle. Additionally, when I placed it on a shelf, my kitty kept knocking it over. I ended up mounting the camera on a camera tripod which both elevated it and gave it a much sturdier stance. The native network interface the camera comes with only allows for four logins simultaneously. While you can make admin, operator, and visitor accounts to set different levels of access, it made my bunny stream hard to share with my friends. I was able to overcome this by coming across this generic web interface a helpful Foscam forum user programmed. Unfortunately, this does require a lot more tech knowledge than the average user will probably have the patience for. The general setup of the camera requires installing extra software and fiddling with router settings in order to view it remotely on another network. While the process is clearly outlined in the instruction manual included with the camera, this may also be something that most people would rather not have to deal with. For those looking for a cheaper IP camera, I also have a Foscam FI8918W at $60 that I use to monitor my front door for package deliveries. The difference of this cheaper model is that the IR filter does not automatically apply on and off so the colors may be more inaccurate. Otherwise, the capabilities — both pros and cons — appear to be the same. The bunny trifecta, Foscam FI8910W, 480p. Another camera that was a top contender for me was a Dropcam. The benefit of this camera was that it is extremely easy to set up, has a high 720p resolution stream, and comes with an automatic web-streaming account that can have unlimited viewers and also be password-protected for privacy. What turned me off this camera was its high price at $150 and the inability to pan and tilt, although the unit itself does seem to be high quality from reviews and sample streams on their main website. However, for those that do not want to deal with all the troubles with settings and webpages and additional tech knowledge you will need to set up the Foscam cameras, the price premium will most likely be worth it. For those that would rather decide for themselves, a search on Amazon for “IP camera” results in a great variety of units. While I am sure that there are much more complicated ways to set up remote viewing of your rabbits such as installing an indoor security system or something more hands-on and open-source like a Raspberry Pi with a PiCam module and a USB wifi dongle, the above were my top three options that I came across in my research of affordable and not-too-complex ways to be a bunny stalker. Some concerns I did not specifically cover in this post include security, recording, and general quality resolution. For those interested, feel free to ask me about them in the comments. Hope this post helped you, and I would be happy to hear what sort of setup other bunny owners have concatenated together in the comments below. 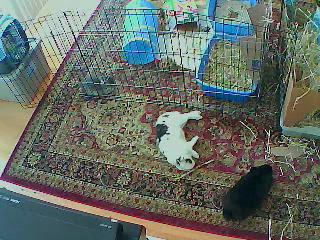 Lounging bunnies, Foscam FI8910W, 480p. 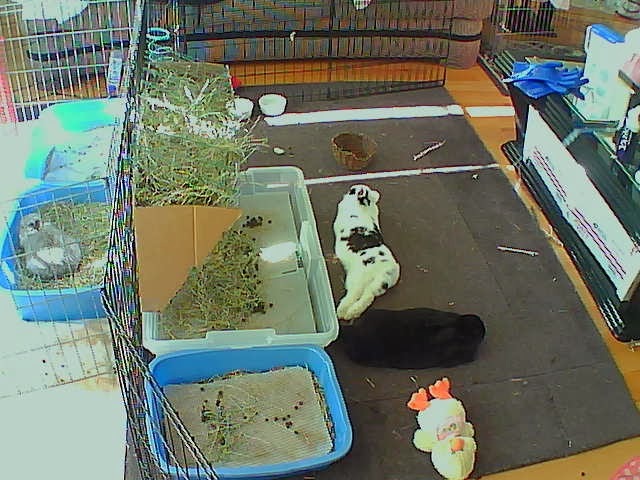 We’ve been very happy with the VueZone cameras (http://www.vuezone.com) for bunny monitoring. Their main feature — completely wireless. The cameras access the internet via a wireless connection to a gateway box that is hard wired to your router. The cameras themselves run on battery power. Ours are still running on their original batteries after 2 years. The don’t have infrared, so they can’t see in the dark, but we use WeMo (http://www.belkin.com/us/Products/home-automation/c/wemo-home-automation/) boxes to control the lights in the bunny rooms. Normally, the operate as timers so the lights are on a schedule, but we can turn them on remotely from a phone to light the room for the cameras, if need be. The final piece in our bag of bunny monitoring tricks is a Nest thermostat (https://nest.com) that makes sure the buns are not too cold and not too hot. Remote access to the Nest also shows us the temperature at any time, so you can make sure your AC is holding up during a heat wave, if you’re not at home. Oh wow, those are some very cool pieces of tech you linked to. If I owned my own home, a setup like that would be attractive. Home automation always intrigued me as well as the completely wireless camera. Thankfully though, living in California meant that I didn’t have to worry about heat or cold too much if I kept the blinds closed all day. However, with your setup, once you start looking at the price tag, it adds up. I was trying to stay under ~$100 or so back when I was on a college student budget. Regardless of my opinion, thanks for sharing!